The product has proven to be a strong seller in a short period of time. We are constantly looking for the right distribution partners to take the Yoke Shopper to the next level. Is the Yoke Shopper of interest to your customers? The Yoke Shopper takes the strain out of carrying shopping bags. 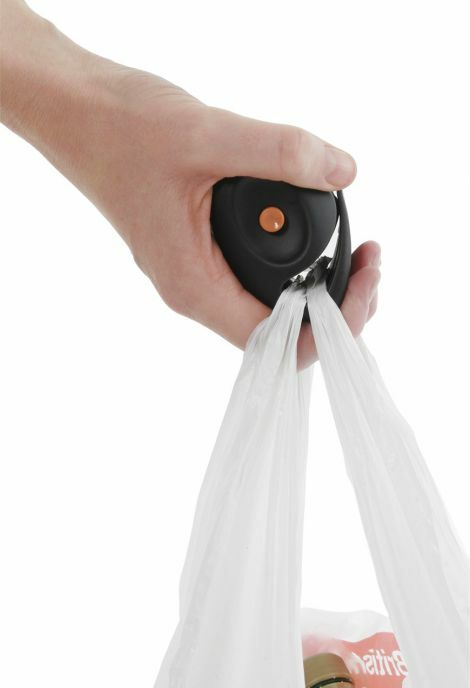 This multi-award winning, ergonomic design will securely lock together plastic shopping bags and most ‘bags for life’. The Yoke Shopper is a compact and lightweight gadget created to take the strain out of carrying shopping bags. This multi-award winning, ergonomic design will securely lock together a number of plastic shopping bags and most ‘bags for life’. With the press of a button shoppers can pull out the desired length of adjustable carry strap allowing them to carry their shopping on the shoulder or across their body. Since the launch in 2009 the Yoke Shopper has enjoyed fantastic international success, selling over 35,000 units in 28 countries. The Yoke Shopper achieved international recognition at the 38th Geneva Inventors Show this year winning gold medal in the ‘Presents and Novelties’ category as well as winning the prestigious judges award for ‘Industrial Design’. The Yoke Shopper has enjoyed a great deal of media interest on the TV, print, online and on the radio, having received media coverage in 45 languages! To review press coverage to date please visit our Press section on the website. The product has proven to be a strong seller in a short period of time; we are constantly looking for the right retail partner to take the Yoke Shopper to the next level. If you are interested in retailing the Yoke Shopper find out more by emailing sales@yokeshopper.com. Our retailer pack includes essential product information, sample products, media and marketing materials. Successful sold at point of sale or throughout a store, the unit is small and lightweight and fits into pockets or bags. Why People Buy The Yoke Shopper? The Yoke Shopper is a compact and lightweight gadget designed to take the strain out of carrying shopping bags. This multi-award winning, ergonomic design will securely lock together a number of shopping bags. With the press of a button shoppers can pull out the desired length of adjustable carry strap allowing them to carry their shopping on the shoulder or across their body. The Yoke Shopper achieved international recognition at the 38th Geneva Inventors Show this year, winning gold medal in the Presents and Novelties category as well as winning the prestigious Judges Award for Industrial Design. This novel hand free shopping gadget has enjoyed a great deal of media interest across TV, print, online and radio – in 45 languages. Buy with confidence. Satisfaction guaranteed. No quibble 30 day money-back guarantee if not entirely satisfied. Yoke Shopper fully supports all environmental initiatives to re-use and reduce the number of plastic bags in circulation. We are proud to say the Yoke Shopper has is designed and built in Great Britain. 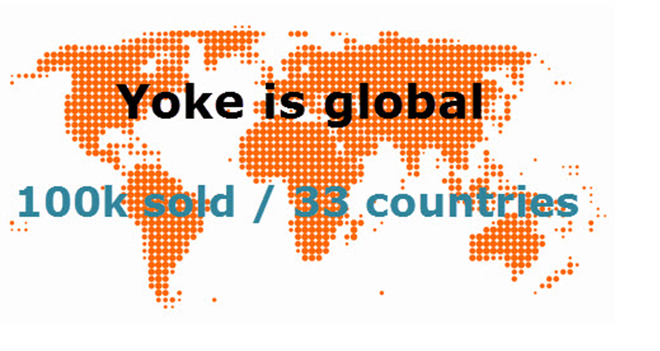 Prouder still that we sell internationally, 28 countries and counting! CARRY SHOPPING BAGS IN COMFORT, IN YOUR HAND OR OVER YOUR SHOULDER WITH THE SMART AND SIMPLE YOKE SHOPPER. Designed and built in the Great Britain, Yoke Shopper is the perfect gadget for anyone who needs to shop, which is pretty much, everybody! Carry all your shopping bags with ease. Keep the pain out of shopping and most of all keep your hands free! Assuming you like your friends, tell them about the Yoke Shopper using your favourite social networks. If you don’t like them, keep quiet and let them suffer!…. Mwa Ha Ha…. Copyright of Yoke Shopper Ltd. All rights reserved. Website built with love, care and attention by Yoke Digital – websites and digital marketing.